Vitellius was the son of the powerful Claudian adviser, Lucius Vitelius (1), and used his father’s position to advance his own career. Consul in 48, he had already acquired a loathsome reputation for vice and greed. Gaius Caligula admired his chariot racing, Claudius his skill in dice and Nero his flattery. From the latter he won a procuratorship in Africa (c. 61–62) and then the post of Curator Aquarum. The fame for gluttony and avarice that Vitellius possessed was probably the reason Galba appointed him in 68 to the powerful office of governor of Germania Inferior. Galba claimed that he had little to fear from a glutton. From the start, however, Vitellius carefully cultivated the favor of the Legions so that on January 2, 69, in conjunction with the plotting of Fabius Valens and Caecina Alienus, two legates of the Rhine legions, he was proclaimed emperor. Thus began the march of the legions of Germania Superior and Inferior to Rome. They caused ruin as they advanced but won the first battle of Bedriacum in April, defeating the army of Otho and winning Vitellius the throne. Their candidate, who lingered behind the advance, entered Rome in July. 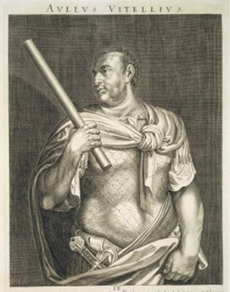 Enacting often thoughtless edicts, Vitellius proceeded to horrify much of the empire with an overly extravagant lifestyle and stupid appointments, such as the new Praetorian Guard. While the historians, especially Tacitus and Suetonius, were harsh and perhaps exaggerated in their coverage of his brief reign, Vitellius certainly did nothing to improve his political situation. He was a failure in terms of defending his throne. The legions of the East declared for Vespasian on July 1, joined by their comrades on the Danube in August. Led by Antonius Primus, the Danubian army set out for Italy. In October they won the second battle of Bedriacum. With the Flavians on their way to Rome, Vitellius considered abdication but was blocked by his own followers, who besieged Sabinus, Vespasian’s brother, on the Capitol, eventually putting him to death. This act enraged the Flavians, and Rome fell on December 20 after a bitter fight. Vitellius was found in the palace and murdered. His reign would be condemned by Flavian propagandists, but he did initiate several good measures, including the freedom of all persons to express their opinion. These few acts of moderation were not enough to save him from his contemporaries or from the judgement of history .